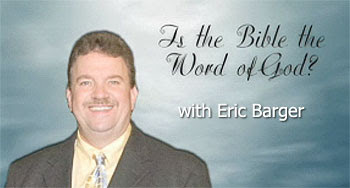 Eric Barger: I preach from the King James Version. I use it in my writings. But, I read other versions and say that no matter what version you are reading, if there is something there that you don't understand and there is something that doesn't make sense to you, everybody use a Strong's Concordance. You can get one on your iPhone or your computer, or the paper book, and everybody should have access to one. It's not rocket science since everybody should be able to access it. With Strong's Concordance we all ought to be able to look at the original words that the English Bible translations are taken from. You can't literally translate from every Greek word into English. Sometimes it takes a sentence to make one Greek word make sense and vice versa with the two languages. So, rather than argue about which version Paul preached from, and I've heard that one before, remember which version Jesus had to preach from. Again, I use the King James and I love the King James. I love the poetry of it and so on. But, if I ever run into a problem or something I don't quite understand, I think it's healthy to always look at the original words. You are going to learn more that way when you dig into it. I go back to the Greek and Hebrew and look at them because they are the original language that the Bible was written in. If you really want to argue what the best Bible is, it's the Greek and Hebrew versions. Nathan Jones: Did you then recommend any modern translation, because there a lot of camps who say that King James is the only version that we can use. Then there are others who will say it's okay to use the NIV or the NAS. And then, of course, we've got all the people who don't even speak English. What about them? Eric Barger: Sure, and there is no Japanese King James Version, for example. There is no King James Version in a lot of these other languages in the world. I don't necessarily recommend or not recommend any of those. I'm not trying to be a fence sitter, mind you. I personally will use the King James Bible, but I will read the others and I have them and I am glad that they are there so that I can find out from more modern English just what some of these ideas mean or what some of the sentences are saying. But, I'll always take it back to the Greek and Hebrew as I think they are the key. Dr. Reagan: I personally have a great admiration for the King James Version. It's had a great impact upon Western society. I enjoy the beauty of its language. Many, many of the terms that we use in English today come from its pages. It's as beautiful as anything that Shakespeare ever wrote, and so I really have a lot of respect for it. What most people don't realize is that the King James is only 400 years old, and prior to that for over a 1,000 years the only Bible that the Western world really had was the Latin Vulgate that Jerome put together. It served the Western world a lot longer than the King James has. When I run into people who call themselves "King James Version Only" claiming that version is the only one you can use or otherwise you are apostate, I wonder what did they think was going on for 1,200 years when people didn't have their favorite version? And yet, they came to know the Lord and they gave their lives to Him. When I was growing up as a kid the only version we had was King James, and I found it very difficult to read. To me it was like reading Shakespeare and I really had difficulty with it, so therefore I didn't read the Bible very much. When I became a freshman in college my mother and dad sent me a Christmas present. I opened it up and it was the J.B. Phillips paraphrase of the New Testament. I had never heard of a paraphrase and didn't know what a paraphrase was, but I opened it and started reading it and I literally could not put it down. I read it day and night through again and again, and it got me interested in reading the Bible. Later, I went to a more literal translation and began to use them. I now use the New American Standard in my preaching today. I think there are some really good modern translations, even including the New King James. What people also don't realize about the King James often is that it has been revised many times over the years. The King James Version we have today is not the King James produced in 1611. It has been revised many times to correct errors and punctuation. Also, thousands of new Greek manuscripts were discovered that don't even have to do with the Bible, but by reading those Greek manuscripts we come to a better understanding of Greek words that have an impact on how we translate. Eric Barger: There are people who will go to the wall over the King James Version. They break fellowship and they even don't want to talk to you. I don't want to shake the confidence that anybody might have in me, but when I got saved I was reading the Living Bible. It's a paraphrase. It was the same for me, a kind of a night and day reading bing. I went from reading the Living Bible to the King James with no time in between. Dr. Reagan: I counsel new believers all the time who tell me they are having great difficulty understanding the Old Testament to get a paraphrase and start reading it. It will help them better understand the Bible's message. But, always remember, you need to get back to a really good translation that is more literal in nature. Eric Barger: Use study helps. You don't have to be a seminarian to use good study helps like a Bible dictionary or Strong's Concordance. In the last part of this series on the validity of the Bible, we'll ask Eric what are some fundamental keys to understanding the Bible. I am SO glad I am not alone in the way the original 'Living Bible' really opened up Scripture for me. As a child I did manage to read the KJV (it was based on the Glos'shire dialect) but didn't realise how hindered I was until the LB came along. I still have its crumpled mess on my bookshelf. My first choice is the NKJ. I also like the Interlinear, which has the original alongside, plus the Strongs numbers to help check up in my Strongs Concordance as my FIRST 'port of call', as it does have a few errors. The Living Bible opened up the Scriptures for me also as a 14 yr old. is rarely used these days. us to "sell our boots and buy one". :)Just wouldn't be without one. I was given a Revised Standard Version in my teens. I started off by reading the New Testament. Quite honestly I found it very easy to read and also could not put it down. As a child I had the KJV but made the great mistake by trying to read through from Genesis onwards. I gave up BORED when I came up to all the "begats" and came to the conclusion that the Bible was boring. We must always remember that paraphrases ARE NOT the Word of God. The Living Bible is the thoughts of an individual - not an accurate translation from the original manuscripts. Why encourage new believers to read a paraphrase? The NIV is better than a paraphrase and very easy to read. Just encourage new believers to read through the NT FIRST before tackling the OT. The OT is understood much better in the light of the NT. I don't need to remember that the LB is a Paraphrase. There has never been any doubt in my mind that the LB was exactly that; and it was sold to me with that caution. WHO has encouraged newbies to read a paraphrase? You have missed the point entirely; this has been about real testimonies of how The Holy Spirit has led us in our Christian walk; not a competition of reading ability and who read the best Bible. After several months with a new NIV, I threw mine in the dustbin; I loathed it and still do! My mother felt the same way - but I accept others think it great, in spite of its problems. C’est la vie! I've missed the point entirely. I would like to provide an example of how some scholars dispute the true meaning of scripture, in particular the King James by using their interpretation of the Greek. In 2 Thessalonians 2:3, some scholars claim the "Falling Away" in the Greek means a "Departure" expanding their belief that this refers to the Rapture of the Church, however this is a grave error. The Apostle Paul identifies in 2 Thessalonians 2:1-2 the proper context and sequence of events leading up to the Rapture or the "Blessed Hope". The coming of the Lord in the clouds of heaven and our gathering together unto him, correlates with that of 1 Thessalonians 4:16-17. It is clear that "That Day" is refering to the day of our gathering in the clouds of heaven to meet the Lord in the air. Knowing this fact presents the case that the Apostle Paul declares that the Rapture will not occur until two events take place: Falling Away (1 Timothy 4:1) or Apostasy, and the initial revealing of the AntiChrist or Son of Perdition. In conclusion and without hessitation we can boldly say that this "Departure" or Falling Away is not the Rapture but identifies with rampant apostasy preceeding the Rapture. Suffice it to say, even the Greek does not help when scholars present their own personal view of its meaning to support a false doctrine such as the Doctrine of Imminence. I am also Pre-Trib and the initial revealing of the AntiChrist prior to the confirmation of the convenant with many (Disarmament Treaty) does not take away from this. "Dr. Reagan: I counsel new believers all the time who tell me they are having great difficulty understanding the Old Testament to get a paraphrase and start reading it. It will help them better understand the Bible's message"
I never stated that I was replying to your comment. I felt I needed to raise a red flag at that. If a new believer is encouraged to read a paraphrase they will be starting their spiritual journey on recycled food. It will give them indigestion. In the end they will need to throw up that food and undo the damage or wrong influence those paraphrases have caused. Why encourage junk food, when proper nutritional food can be given to help nurture proper spiritual growth? I think that the apostate church has been allowed to spread because paraphrases etc have opened the door to deception from preachers who twist the truth by using "convenient" bibles to spread the error. Many of those who start on paraphrases will prefer them and not read the reliable translations and therefore will not recognise deception when it comes. Thess2:2 concerns the day of The Lord and why the Rapture has no part in it. Imminency is a fact of tense and Grammar. Pre-trib IS imminency and imminency IS Pre-trib meaning no prophetic event HAS to occur before the Rapture, such as the revealing of a/c. The Apostles ALL expected Jesus to return at any moment. They used personal pronouns and continuous present tense to include themselves and their hearers including us. They were looking for Christ to return in the Harpazo and definitely not the a/c. It is a fallacy that 2Thess is about the Rapture. The day of the Lord/Christ is not the Rapture. Vs.3 makes it plain that THAT day – the Day of Christ when He executes His judgments on the nations and their ruler a/c in order to bring Israel to repentance in Revelation. THAT day will not come UNTIL the Restrainer is removed in order that a/c can be revealed in Vs7,8. Upon the unsaved vs.10;that THEY should believe a lie vs.11; that THEY might be damned vs12. Paul has changed from personal pronouns and is excluding himself and all believers concerning THAT day. 2Thess2 concerns the Tribulation THE day of the Lord/Christ, it is not about the rapture at all. The Church is gone so THAT day can begin by the revealing of a/c. The proper context E.I. is future tense. The Thessalonian believers had believed that they missed the "Blessed Hope" and were now in the Tribulation, yet it was clarified that the day of our gathering unto Christ would not occur without the falling away or apostasy and the initial revealing of the AntiChrist. It was also certain that it was not for the Apostles to know the time and the season for it was for a time yet future. The generation that would see the signs progress would know that they were in the time of fulfillment. The context for the Rapture to occur was/is always in present continuous tense, the ‘blessed hope’ is the same and is what ‘imminent’ means. The unexpected return of Christ in the air for His Bride was a present tense hope, with no previous signs 2000 years ago and it continues until today. Paul says concerning the gathering together, don’t be shaken, and don’t worry about it, thinking the Roman persecution was THE DAY of Christ already arrived. Paul was clarifying that THAT DAY could not begin until certain events happend first. Paul was referring to ‘THAT DAY’, the 70th Week. The context concerns THE DAY OF CHRIST which cannot begin before the man of sin is revealed. The subject does not concern the gathering; Paul’s subject matter was THAT DAY – the time of Jacob’s trouble. The Day of the Lord is not the Rapture. 2Thess2 has no bearing whatsoever on the timing of the Rapture. That's a pretty good response there, EI. I'll pay that! Leah, here's Dr. Reagan's reply concerning the King James Version. Frankly, all this squabbling over versions of the Bible is pointless. We might have a preferred translation from one of the many translators who've tried their best to be most accurate to the original texts, and they've each affected us greatly. It's the Holy Spirit who decides which translations are needed at which time period, and the rest fade into oblivion. People are saved from reading the Bible in whatever translation. That's God's endorsement. When we fight over this, we risk falling victim to the wise words of Acts 5:39. Rodney, you're clearly very passionate about the Church's condition today and if memory serves believe we are in the Great Apostasy. If you feel that's a prerequisite for the Rapture and doesn't occur after, what are your thoughts then on why we haven't yet been raptured? With respect, I do not think you can use Acts 5:39 as an argument to back up Dr Reagan's comment. Acts 5:39 reads "But if it is from God, you will not be able to stop these men; you will only find yourselves fighting against God." First of all, who was it who spoke in Acts 5? It wasn't from a Christian believer! Secondly, if we use that verse to say it is wise counsel would be to ignore evidence. We would have to say that therefore Islam must be of God, Word of Faith must be of God, the Catholic Church of the dark ages must have been of God, ecumenism must be of God, the current apostate church must be of God etc etc. All of these have grown immensely, but they are NOT of God. Please, we as believers need to be strong and realistic and use solid arguments. Acts 5:39 is not a solid argument for our day. It WAS used by God to protect the disciples at that time, but it was used despite that it came from "the wisdom of this world". We say 'I'll buy that!' Cheers! good to see ya! Can't quite get my facts clear on this, but in the Middle Ages, men were sent into Europe as salesmen selling haberdashery - ribons, lace and such like. They wrote verses onto scraps of paper and if the coast was clear, they then distributed as many 'crumbs' as they could manage and legged it before they could be caught and 'done in' by the Papists. It wasn't much, but The Hoy Spirit used it and gave the increase. I have been led of the Lord to give a childrens Bible full of pictures to a full grown man with learning difficulties - that was my part, the rest is in the Teachers hands. To begin with, it is merely a question of getting the gist of Scripture; being alerted to its existence and Life; it is a 'crack in the soil' into which The Lord can drop a tiny seed of faith and hope. Serious study comes later as The Holy Spirit leads. I agree with Nathans use of this Scripture, regardless of who said it or why. Every part of God's Word is living and active like a two edged sword. Who are we to doubt His merciful methods to win a soul to Christ? "My ways are not your ways..."
Disciple, you took my reference to Acts 5:39 to limits unbound. Gamaliel, an expert on God's Word, knew by the evidence how to recognize God's work. God's work by the Holy Spirit brings people to salvation. If the Holy Spirit is bringing people to salvation through the reading of various translations of the Bible - and He is - then for us to berate a translation is to berate the very Word of God and the Holy Spirit's work (which might I add could fall under the unpardonable sin of Matthew 12:31-32). Acts 5:39 then is incredibly applicable to this conversation. If we were just referring to the translations from the manuscripts, I would agree with you. However, as EIR pointed out Dr Reagan was recommending the paraphrases. By the way, Gamaliel was not a believer. If he was so wise or knowledgeable of God's word, he would have trusted in the Messiah. I mean if it is true that he recognised God's work, he should have recognised that Jesus was the Messiah. I am concerned about those like seeker friendly, emerging church etc that have been influenced by paraphrases, especially "the Message"
But, Disciple, you and others who wrote in only heard the part about Dr. Reagan having once used a paraphrased version of the Bible and then ignored the rest of what he said like, "But, always remember, you need to get back to a really good translation that is more literal in nature." Context shows there's no fear we're diving into the Emergent movement. I accept that, but Dr Reagan clearly said that he encourages NEW BELIEVERS to read a paraphrase. "Dr. Reagan: I counsel new believers all the time who tell me they are having great difficulty understanding the Old Testament to get a paraphrase and start reading it"
I agree with EIR that there is absolutely no need for new believers to read a paraphrase. Instead they should be taught how to read/study the proper Bible versions for themselves. To expose vulnerable babies or children to possible hidden poison is totally irresponsible of parents. I hope I do not presume too much, but by yours and EIR comments I sense that you are both blessed with a choice of Bible believing/teaching Church’s in the U.S.? That is an ideal that most of the world does not enjoy including areas of the U.S. Most of us are on their ‘Jacks’. Holy Spirit dependent, void of teachers, starving for fellowhip believers who would have LOVED the advantage of just ONE person to open up the Scriptures with. Babes in Christ need simple nourishment to begin their walk – would you deny them/me help from a paraphrase, to bring understanding when the literal interpretation still needs to be recognised, let alone understood. THAT was my ‘lot’ and I am not complaining about it. The Holy Spirit has faithfully led me through a barren land from Oasis to Oasis and I am doubly blessed for that fact. The Living Bible (original) was food from the beak of a Raven to me. Did it harm me; was The Holy Spirit thwarted because I lacked the advantage of a sound and uncompromising church to teach me? I still have far to go, but I really believe I have done well under the supervision of the One Jesus said would lead me into all truth. Most of us in this world have HAD to prove the faithfulness of God to teach when there is no man to do so. Dr. Reagan has understood this. PLEASE do not inflict us with guilt and condemnation for having to read a paraphrase with ‘only’ The Holy Spirit as guide. The Grace of God far, far exceeds the expectation of the strongest and best taught disciple. By the way, my parents eventually came to faith in Jesus through me, their child. Nathan, I believe the Apostle Paul clearly identifies the reason why we have not yet experienced the "Blessed Hope". True, we are experiencing a Great Apostasy yet the Son of Perdition has not initially been revealed. The AntiChrist will rise to power during great calamity offering peace and prosperity. I believe his rapid rise to power will come on the heels of a global economic collapse which we are seeing progress at this time. It is also clear that he will formulate a policy of peace with many nations, it is probable that it will be a disarmament treaty formulated after the greatest event in history witnessed very soon which is the Battle of Gog/Magog of Ezekiel 38-39. I personally believe that the Rapture of the Church will occur during the aftermath of this great battle in which the Lord God reveals his glory to all the nations of the world. The ‘blessed hope’ that Paul himself was looking for is the imminent (no signs) return of Christ Jesus for His Bride; we haven’t experienced it because He hasn’t come for us yet. The Day of the Lord (70th Week)which starts when a/c confirms a 7 year Covenant with Israel has no part in what happens with the Church at the Rapture. The context of Daniel 9:27 concerns ISRAEL. An existing Covenant, (suggested by it being ‘strengthened’) is made with many (the majority vote of Israel). The subject matter is Israel and does not mention other nations. It COULD involve a peace treaty, because a/c comes in with ‘stealth’. Scripture does not actually state is as a fact – it is an assumption. With respect Rodney; I cannot see Scripture agreeing with what you believe here; the facts don’t support this theory, but that’s as much as I want to say right now other than to suggest you take the Word ‘as is’ and don’t make so many assumptions forcing a pretext to support some preconceived theories. Nathan quotes Dr. Reagan as "People are saved from reading the Bible in whatever translation." I'm sure he didn't mean any liberal version that may exist out there that are politically correct or refuse to use male pronouns for Jesus, etc. E.I. just for the sake of argument, "What convenant of peace would Israel need confirmed by the AntiChrist, if they are busy burying their enemies for 7 months". I think it is foolish to assume that Israel would require any security agreements from foriegn dignitaries considering the fact that the Battle of Gog/Magog will eliminate a significant majority of these enemies. This covenant or treaty that the AntiChrist confirms is with many as the scripture declares, it does however not identify Israel in this process, that is a matter of speculation. Would I need a third party to intervene between me and my enemy if I am burying my enemy in the ground? I think not. I believe personally and always have that the treaty or covenant introduced by the AntiChrist will be a nuclear disarmament agreement. Under those conditions that AntiChrist will seek to emulate prophecy concerning the Messiah in turning weapons of war in to agriculture tools. Have a shuffle through all your puzzles and look for the right picture to follow. Your 'arguments' are based on your personal beliefs and assumptions. Scripture has to interpret Scripture, from a normal/literal understanding as we would read our Tax forms. Applying your own theories and wild speculations as an interpretation and you would soon be repenting at your leisure in the nick. As the Apostles were personally EXPECTING Jesus to return IMMINENTLY, with no mention of the need of Ezek38/39 battle to occur first, then your argument is null and void. As the rapture is blatantly imminent, by believing it will come after said war is to ignore all the efforts put into Scripture to induce an expectancy of 'any moment now Rapture'. Placing it AFTER the Ezek prophecy, flies in the face of imminency, while ‘looking for’ (present tense) the ‘blessed hope’ (present tense) with an attitude of expectancy goes out the widow. You frequently use the phrase 'I believe personally' is an 'opinion' and the definition of an opinion is an idea devoid of facts. What you believe has to stand the test of two or three factual witnesses from Scripture before it can be credited with being Biblically accurate. As a casual observer, I see that the points made by Rodney and Expected Imminently both have their merits. EI I can understand your logic re imminency. Does that mean that Gog and Magog wars CANNOT take place until after the rapture? If we use that logic we would say that the Jews returning to the Land could not have happened Before the rapture because of Imminency. But as we all know that scripture has been fulfilled. So in the same way, surely Gog/Magog wars could happen before the rapture? 'Imminent' means 'expect at any moment with no prophecies HAVING to occur' It is 'overhanging' or 'pending'. It is an unknown event; unlike the 2nd Coming which is unknown at present, but when the 70th Week begins it is not imminent, it is still 7 years away. The FACT that certain prophecies HAVE and may YET occur, does not affect 'imminency'. All we know for certain is that the Church is not involved in the 70th Week - the Time of Jacob's Trouble which is when God turns His full attention back to Israel. So we MAY see the Gog/Magog war as well as the preceding destruction of Islamic power? It will take 7 years for ISRAEL to burn the weapons so ... I will leave that rather long subject there and say that I stand by my name 'Expected Imminently' for the simple reason that so did Paul and His brethren. Rodney and Casual, I have a hard time seeing the Rapture after the Gog-Magog Battle because the attention of God is back on Israel during that battle and not on the Church. This would indicate to me that the Rapture has a better chance of happening before Ezekiel 38-39 finds fulfillment. Here's how I see Gog-Magog and the Rapture falling in order of events. You may be right. However, I cannot go along with the logic. Why? Because, then you could say that God's attention was not on the Jews when they returned to the Land in 1948 and would have to agree (with the conspiracy theorists) that Israel is a Political accident. However, it is clear that God's attention is again back on the Land, He is bringing the Jews back to the Land (gradually) from the 4 corners of the Earth. Is it not possible for God's attention to be on both the Church and Israel at the same time? I would agree that when Israel receive a heart of flesh, it will be after the rapture, but whilst they are still in unbelief (in the midst of the war) God's focus will still be on the church until (just before) Israel receive their Messiah. I wrote (in reply) to you on friday awaiting your reply. I think the weekend may have caused you to miss it. I will write it again as am interested in your response. You said (re something Dr Reagan said) "But, always remember, you need to get back to a really good translation that is more literal in nature." I said: "I accept that, but Dr Reagan clearly said that he encourages NEW BELIEVERS to read a paraphrase. To expose vulnerable babies or children to possible hidden poison is totally irresponsible of parents." Ah, Casual, but then you'd be advocating a Post-Tribulation Rapture, while the Church is clearly not even in the Tribulation (1 Thes. 1:10; 5:9; Rom. 5:9; Eph. 5:6; Col. 3:4; Rev. 3:10 and Isa. 26:19-21; Mal. 3:17; Lk. 21:36; Jn. 14:1-14; I Cor. 15:51-58). What we're seeing today is the prepping of Israel to become the focus and the Church to phase out of the focus, so it could be argued that God's focus is on both at the same time as they pass in and out. Still, I'd be very, very surprised if the Church bears witness to Ezekiel 38-39 being fulfilled before the Rapture. Another reason being is God's supernatural presence made known to the earth through the destruction of the Gog-Magog forces. For more on this, see my article Timing Gog-Magog. I believe the rapture will take place before the tribulation. I was just using my logic to show that there could possibly be a slight overlap of the Gog and Magog war, but I accept your point that God is (at the moment) preparing Israel rather than full focus as it is still the time of the Gentiles. Disciple, I personally would never use a paraphrase and to my knowledge never have, unless I count comic book Bibles for my little kids to introduce them to the Bible. Others who are spiritual "kids" may need a paraphrase to go along with their standard Bible, and the proof of the Holy Spirit using that is in the testimonies above. In my understanding a paraphrase is an interpretation of singular individuals not referring to the original manuscripts, whereas the reliable versions DO refer back to the original Greek and Hebrew and is done by teams, not just individuals. The main versions try not to carry any bias whereas paraphrases do have that tendency - especially The message. Therefore, you cannot call the KJV, NIV etc paraphrases, surely not? In my understanding a paraphrase is an interpretation of the English Bible versions by singular individuals who do not refer to the original manuscripts. Thankyou Nathan for that link. I think I will rename myself to "not so casual observer". I have now read your link. I can follow the logic of your list of events. However, I notice something which doesn't quite fit in, unless you can explain it. I have also read through Ezekiel 36 to 39. Nowhere within these chapters does it mention a Tribulation for Israel. Ezekiel 39:29 and in Ezekiel ch 36 and 37 mentions the outpouring of the Holy Spirit, which seems to link with Zechariah 12 and 13 which coincides with receiving Jesus as the Messiah. The lead up to that outpouring seems to be linked to a period of ongoing peace after Gog magog war during a period when God makes Himself known. I cannot find any reference to a time of Jacobs trouble during these 7 years within those chapters. "I will set My glory among the nations; all the nations shall see My judgment which I have executed, and My hand which I have laid on them. So the house of Israel shall know that I am the LORD their God from that day forward"
If other scripture passages mention that Israel will suffer tribulation during this time (I can't actually find any conclusive passages), why does Ezekiel state there would be peace with God (in the Land) after the Gog war? In fact Zechariah 12 to 13 doesn't mention Tribulation for Israel either. Isn't it possible that Israel already suffered it by the Nazi's as God's plan to bring them back into the Land? There are some that say (example Arnold fruchtenbaum) that the purpose of the Tribulation is God judgements against Israel. Are there any clearcut passages that prove this? I ask for clearcut because I notice that Arnold uses vague scripture verses to prove this point. There exists a transition point to where the Church Age ends and preparation for the Kingdom Age begins, this transition is found in that aftermath of the Gog/Magog battle of Ezekiel 38-39. I have provided this evidence many times, yet it clearly remains ignored. The following passage found in Ezekiel 39:29 illuminates this well: "Neither will I hide my face any more from them: for I have poured out my spirit upon the house of Israel, saith the Lord GOD". The context of this passage is in the aftermath of the Gog/Magog battle and also identifies with the fulfillment of Joel 2:28-29, though partially fulfilled at the Day of Pentecost as recorded in the Book of Acts. The Spirit of the Lord God will be poured out upon Israel to prepare the 144,000 and the people, for the coming of the Great King and Redeemer. The context also identifies that it occurs prior to the great and terrible or dreadful day of the Lord, as also the prophecy concerning the coming of Elijah. It should therefore be evidenced that during the aftermath of the Gog/Magog battle, the face of the Lord will be upon his people Israel and the nations will be judged according to their treatment of them. In order for the full attention of the Lord to be directed to his people Israel in preparation for the Kingdom Age, obviously the Church Age will have expired also in the aftermath of this battle in the form of the Rapture. I believe this is pretty concrete evidence. Casual, the glory that the Lord will present in the midst of the enemies of Israel will be the Third Temple. The heathen everyday will no longer see the profane structures that now dot the landscape of Mount Moriah, for they will be reduced to rubble and dust swept away by the mighty hand of the Lord. The Temple will set as a testimony that the Lord God is again in the midst of his people Israel, who then will make them afraid? Disciple, sadly there is so much lost in the translation from Hebrew/Greek to English that by comparision our English translations do seem to read like a paraphrase. I'm no expert in the original languages, but when I was exposed to them it just shocked me how 2-D a lot of the English wording became in expressing the original biblical ideas. Exactly, (Not so) Casual, Ezekiel 38-39 is devoid of the Tribulation, the "time of Jacob's trouble" (Jer. 30:7). That's another good reason I believe it will happen before the Tribulation. Not all of the Jews will be running to Jordan, as many will be left to defend Jerusalem to the end and could continue burning the weapons, as I believe. Dr. Reagan suggests that if that's not the case, then Ezekiel 38-39 could happen 3.5 years before the Tribulation to fulfill the 7 years of burning. The peace covenant with the Antichrist could logically come after God's miraculous victory protecting Israel against Gog-Magog, giving him the time needed to conquer the rest of the world before turning his attention halfway into the Tribulation back to Israel. The treaty then would be for Israel's peace at least in their won minds, but in reality is an opportunity for the Antichrist to conquer the world without the interference from the new world superpower - Israel.